I took a ride on the Columbia Trail from Long Valley to High Bridge the other day, continuing on to Spruce Run Reservoir before returning. The Columbia Trail is an old railroad right of way which has been converted to a mixed-use trail. The trail winds its way through the Ken Lockwood Gorge. On my way back, I stopped to fish for 20 minutes in the South Branch Raritan River in High Bridge. Here is a short video from the trip. For a while now, Google has included built in PDF rendering capabilities within the Chrome Browser. I never liked this because while it is lightweight, it is missing many features that a real PDF reader should have. E.g. : You can’t rotate PDF files while viewing them, the printing options are far limited compared to Acrobat Reader, etc. Today after filling in a 6 page PDF form from within Chrome’s PDF viewer, I saved the PDF file to my desktop with the intention of emailing in the completed form. It was then that I found that Chrome’s PDF handling does not save the contents of any editable fields with the saved PDF. LAST STRAW! Google has made this terrible PDF solution because they feel that they know best. They think that users should choose a lack of features over having to keep their PDF reader software up to date themselves. I disagree. Currently, requests to en.wikipedia.org are timing out or returning the error message below. Hopefully they will get their systems sorted out quickly. While I am glad that they are trying to stay current, one would think that one of the most trafficked websites in the world would plan its software upgrades more carefully. So, I am a New Jersian who frequently travels to Manhattan for both business and pleasure. Due to the difficulty of traffic and parking in New York City, I prefer taking mass transit, so improved rail access to the city is something which I support. When Governor Christie cancelled the ARC tunnel project, I was disappointed. It turns out that my disappointment was unfounded, and that Christie’s cancellation of the project was the right move. Today Amtrak announced it is planning to build a very “Gateway” tunnel project very similar in route and purpose as the ARC tunnel, but to be built for Amtrak instead of NJ Transit and paid for almost entirely as a federal project instead of the largely by NJ tax payers. So we New Jersians get our better rail tunnel (in 10+ years…) and don’t have to pay out the nose for it! Good deal. Gov. Christie, Democratic U.S. senators scramble to take credit for Gateway tunnel project | NJ.com. I will continue to post major updates on this issue here, but there will be a lot more information available over at the Friends of Splitrock website. Already I have gotten some positive news from the DEP regarding the closure, so check it out. I visited the Splitrock Reservoir this evening expecting to get some good fishing in. I had been chased off the water early on both Friday and Saturday nights by thunderstorms moving into the area, but the temperature was back down to the mid-eighties today and the full moon was going to be coming up right after sunset. Perfect evening fishing conditions… I was very excited. Until I got to the reservoir parking lot and found this. I apologize for the low quality of the images. All I had with me at the time was my phone, but I felt that this had to be documented. 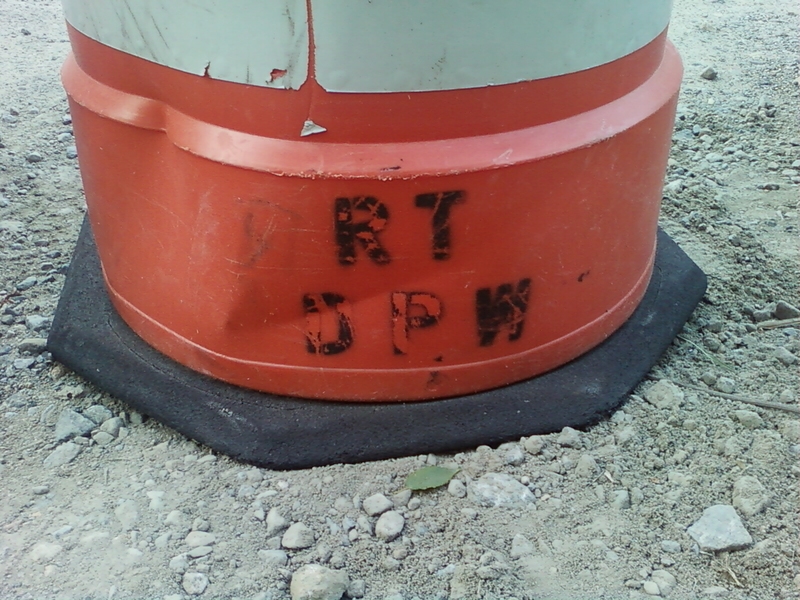 The barricades, cones and barrels bear the markings “RT DPW” and “RT TRAFFIC” indicating that they are owned by the Rockaway Township Department of Public Works and/or Traffic Department. The entrances to the parking lot are now completely blocked and there is no way to enter the lot and legally park to use the reservoir. 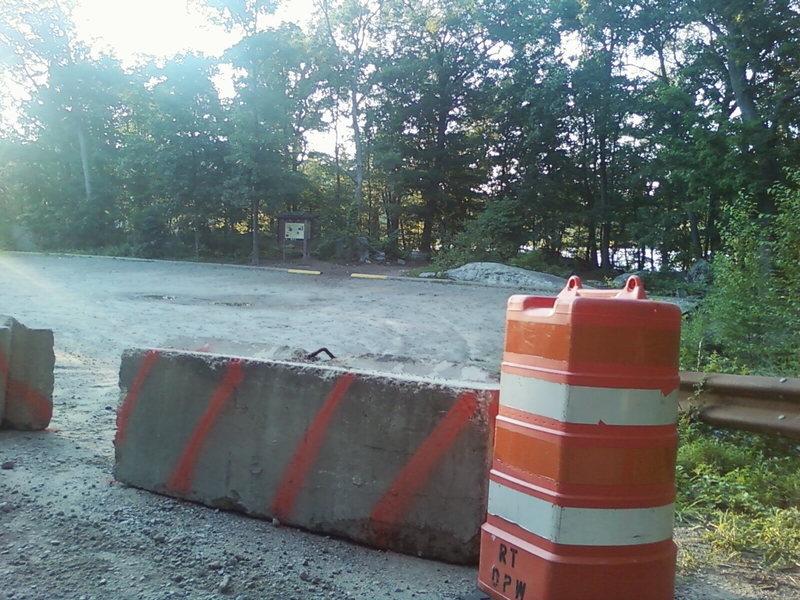 There is nothing to indicate why the lot has been closed or when it will reopen. I called the Rockaway Township police department around 7:30 pm to see if I could find out what was going on. The dispatcher on duty I spoke with was unfamiliar with the situation at the reservoir, but said he would reach out to his sergeant and give me a call back. Sure enough a little while later, the dispatcher called me back and informed me that his sergeant would be at the reservoir shortly. I met with Rockaway Township Police Sergeant Kepler outside the closed parking lot shortly after 8 pm. 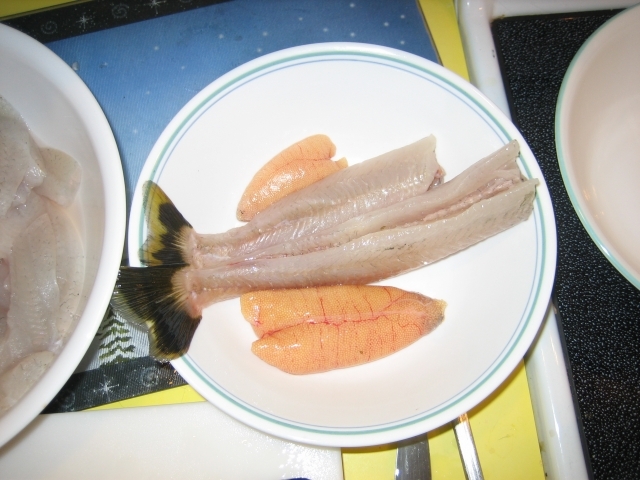 The sergeant, a fellow fisherman, was kind enough to fill me in on the little he knew of the closing. 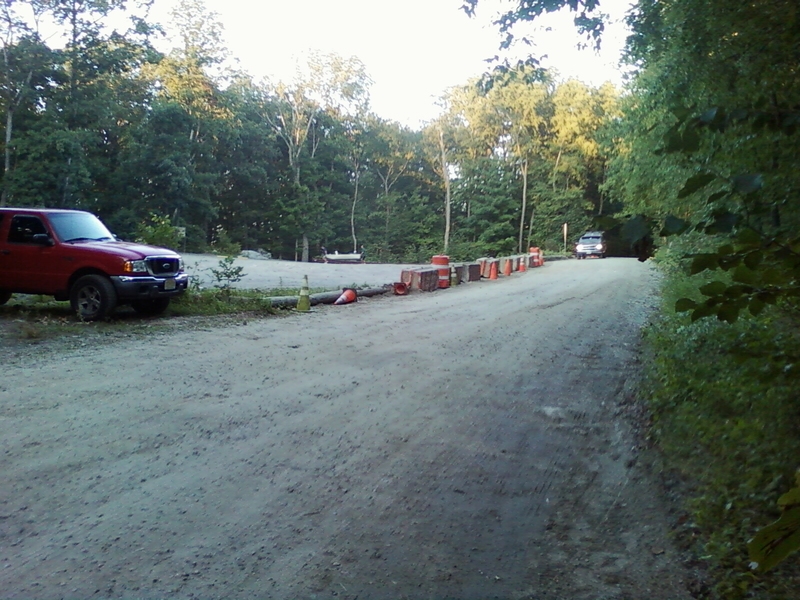 As it has been explained to the police department, Rockaway Township Town Council had ordered the DPW to block access to the parking lot today. The police have been given no official explanation why the parking lot has been blocked and have been asked to inform the public to direct any questions regarding the closure to the town council. Rockaway Township has not issued any memorandum to the police department explaining the situation or how long it may last. In fact, Sergeant Kepler was only informed of the closure verbally at 6pm today, when he came on-duty and relieved the day sergeant. He was able to speak with me because he had been in the area to view the closure for himself. When asked if his officers would be issuing any tickets to Rockaway Township officials related to blocking public access to the public resource Sergeant Kepler said “that was not a police matter.” The sergeant did share my concerns that the parking lot had been closed without any notice or signage. 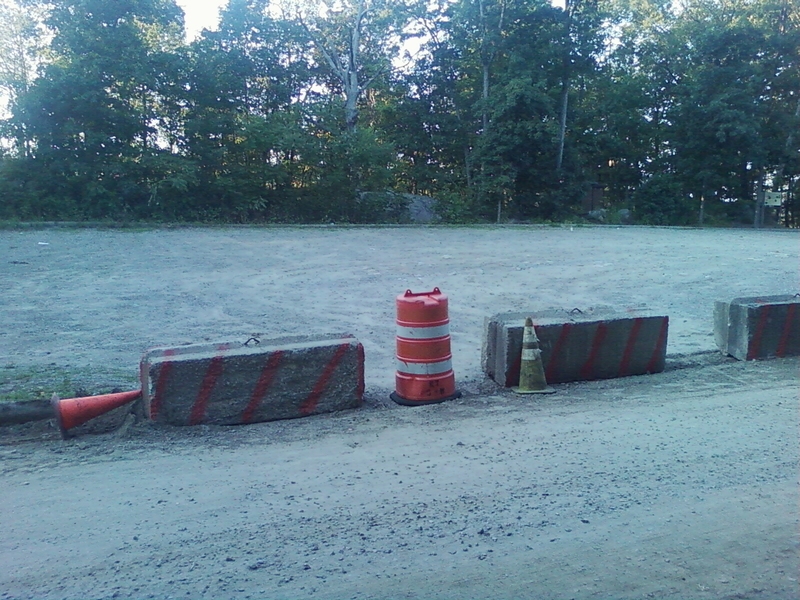 The concrete barriers had been stacked to the side of the parking lot during the previous weekend. At the time I had assumed they were planning on closing down some of the areas where people park outside of the main lot. I never imagined that they would be closing the entire parking lot. In any case, the fact that the concrete blocks had been in position before the weekend shows that this was planned well in advance. 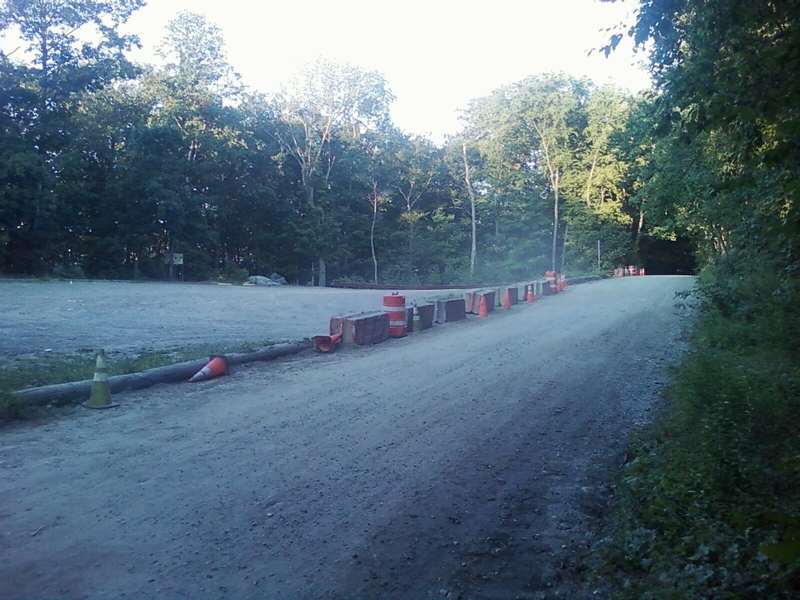 Having been planned in advance, Rockaway Township should have notified the public or at least have put up some signs. Splitrock Reservoir is owned by Jersey City for water supply purposes and was opened in 2003 to limited recreational use. The reservoir and surrounding property (a part of Farny State Park) are open to boating (no gas motors, no trailers), fishing (from boats only) and hiking. 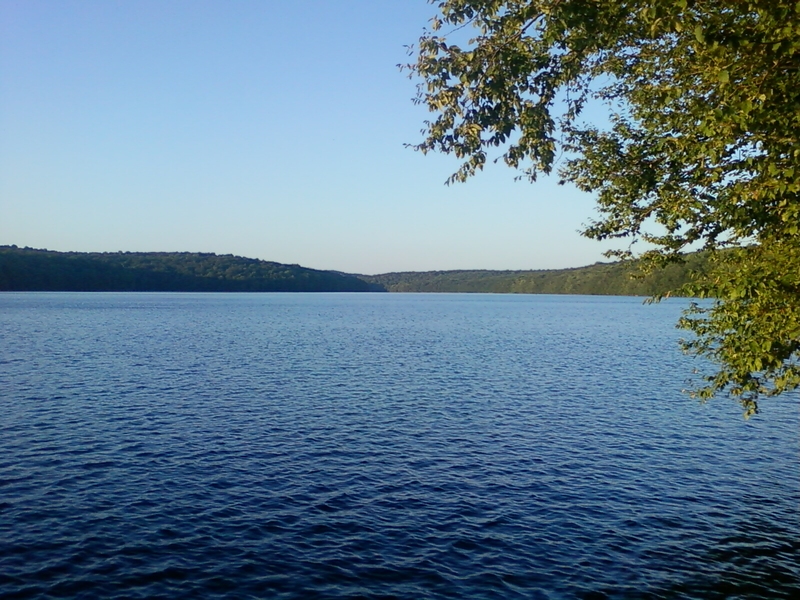 However, there have been plenty of people coming to the reservoir to swim and camp, which is not allowed and has gotten the Rockaway Township Council in a tizzy. More background information on the issues at Splitrock are available at the links below. It seems to me that the township has grossly overstepped its bounds by prohibiting access to a state resource. I will be following up with everyone I can think of at Rockaway Township, including mayor Louis Sceusi, as well as down in Trenton starting tomorrow morning. Check back here soon for ways you can get involved. Visit FriendsOfSplitrock.org now to get involved! In the meantime, leave a comment, post this to your Facebook wall, tweet this… whatever you can do to raise public awareness helps! What do you do to fix the problem? Apparently, you party. I am *really* not clear on what is happening here. Perhaps something like in the Michael Jackson 'Bad' video? Now don’t get me wrong, I am all for partying WHEN THE JOB IS DONE, but DICE has obviously dropped the ball when it comes to providing the services their customers have paid for… so get back to work! How much money was spent on these golden jacketed dancers at last night’s event? 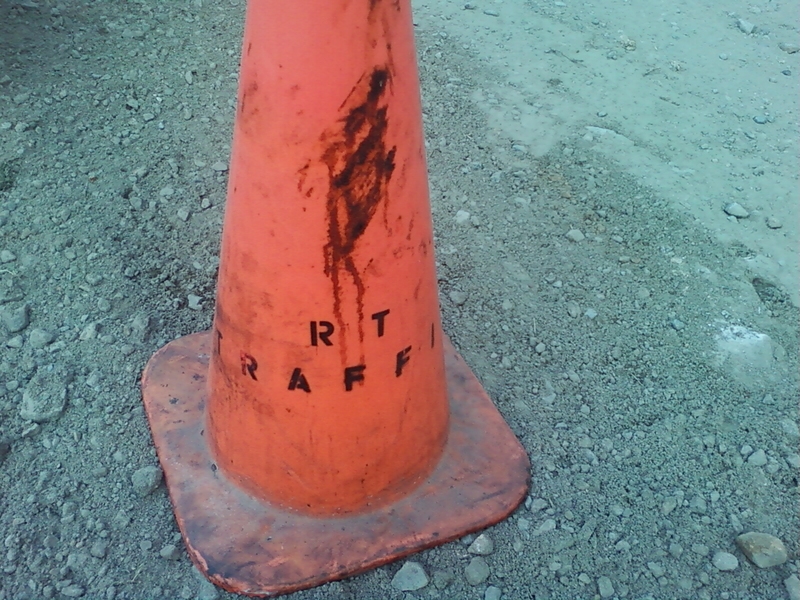 Maybe some of that should have been funneled to the Quality Assurance department. Despite having a major infrastructure in place, the peak traffic this weekend has been huge, 400% higher than any other Battlefield’s peak simultaneous users. Really? The game you had over 2 million demo downloads for and have been heavily advertising during prime-time television is popular? Huh, I guess nobody could have seen that one coming. Get your house in order EA/DICE… you should be embarrassed.